22nd July 2014 – Bitstars.net announced today that they have signed a deal with Ezugi for the supply of a full suite of live table games ranging from Live Roulette to Blackjack, Baccarat and even Lottery. Last month Bitstars announced that they were set to drive the adoption of Bitcoins to offer a fantastic user experience where players can get hold of Bitcoins or withdraw them instantly. Today’s deal continues to show the significant growth Bitstars are aiming for as they are once again back with the addition of more fun and entertainment for their players. The live Casino games will be streamed from Costa Rica by beautiful female dealers who will be ready to offer players a red carpet treatment. Commenting on the partnership, Nikolica Vadaski, head of Bitstars Casino said: “This is an excellent opportunity for us as we continue to build our brand and expand our offering. We believe that Bitstars’ live casino concept will prove extremely successful in the bitcoin world, particularly in our current English speaking markets”. He added “In just a few years the bitcoin gambling space has developed rapidly and the competition out there will continues to get more competitive and crowded. However in saying this, our players have learnt that they can count on us to be the first in the industry with any break trough’s and just like today’s deal, we will continue to add much more original products in the future to really provide the best selection of casino games to our players and provide them with the best bitcoin casino experience around“. 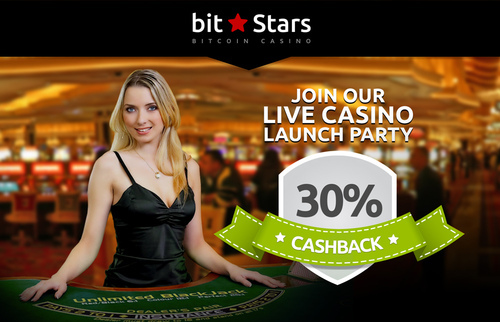 Bitstars will now provide its customers with a whole new level of interactivity that is usually seen in traditional live dealer casinos; an exciting combination of real-time gameplay and social media experience that will keep users playing and depositing without having to leave the table. In a matter of a few months Bitstars has gained a solid status on how it strives to offer its customers a safe, fun and user-friendly online gaming experience. Last month they added more than 10 NEW and exciting games all available on mobile and they will be announcing further releases very very soon. Be sure to stay on the look out. They will also remain focused on delivering stunning provably fair games, always ahead of competition where it comes to the visuals and game detail. Find out more about Bitcoins Here and be sure to keep on the look-out for bitstars.net news in the coming weeks for all that is still to come.